Families of the six victims and survivors intend to take legal action against the various aviation companies implicated in the crash at Cork Airport a year ago. The remains of the Manx2 flight that crashed on its third attempt to land at Cork airport a year ago today. THE SOLICITOR ACTING for most of the families of the six victims and six survivors of the Cork air crash has said that the pilots’ decision-making process was the main cause of the crash which took place a year ago today. James Healy-Pratt has said that a number of “disturbing facts” emerged from the preliminary report by the Air Accident Investigation Unit. The AAIU is due to issue its final report in the coming months. Healy-Pratt said he expects to file legal proceedings against various parties in a number of jurisdictions in the “foreseeable future”. 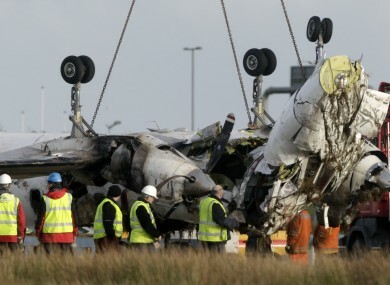 The Manx2 flight – the operation of which was leased to Flightline BCN – from Belfast to Cork crash landed on the edge of the runway at Cork Airport just before 10am on Thursday, 10 February 2011. Six people including the two crew died while six others survived. The crew had already made two attempts to land the plane before it crashed on the third attempt. An interim statement from the AAIU this week reported that there had been a fault with a sensor on one of the plane’s engines as well as with temperature readings. But Pratt, from specialist aviation lawyers Stewarts Law LLP, has told TheJournal.ie that it was the decision to make the third approach at Cork Airport that was the primary cause of the crash. “This accident was caused primarily by the pilots doing the aviation equivalent of jumping three red traffic lights in fog,” he added. Flightline BCN did not return a request for comment. Manx 2 said that it would be “inappropriate” to comment further during the ongoing AAIU investigation but sought to clarify that it was the “ticket seller” and did not operate the fateful flight. The inquest into the death of the six people on board cannot begin until the final report is published by the AAIU. Pratt believes it could take as long as six months but indicated that he was happy with the progress investigators are making. “Air safety is a right, not a privilege. The families of Manx2 and the travelling public deserve to know the truth about what happened on that flight deck, and why the two licensed pilots made multiple illegal approaches to land at Cork, ultimately with tragic consequences,” he said. The preliminary report issued last year said that several factors into the crash were still being investigated, including the experience and training of the pilot and the co-pilot. In its interim statement this week the AAIU said there had been an issue with the sensor on the right-side engine of the plane. Investigators are also examining several operational aspects of the flight including operational control and regulatory oversight. This includes the examination of the relationships between Flightline BCN and Manx2 and the undertaking which supplied the aircraft and flight crew. Manx2 has ended its relationship with Flightline BCN and has discontinued its Belfast to Cork route. Flightline BCN has since lost its licence to fly the Metro III plane involved in the crash. This plane was manufactured in the US by the company Fairchild which did not return a request for comment. “That they lost their licence is very clear evidence that they were incapable of operating that aircraft,” Healy-Pratt claimed. He said that legal action was also being taken against the plane manufacturers in the US. The president of the Irish Airline Pilots’ Association, Captain Evan Cullen, has also raised concerns about the way in which Manx2 operates saying it is not an “appropriate structure”. He told TheJournal.ie: “We’re concerned about the oversight of the entire issue. It was a company set up to sell tickets and then the aircraft and operating cert are imported from Spain. TheJournal.ie put a series of questions to Manx2 related to Cullen’s comments, its contact with the victims’ families and survivors of the crash, its relationship with Flightline BCN and its status as a so-called “virtual airline”. “As Manx2’s website has always stated, the operation of Manx2 flights is contracted to air carriers licensed and insured as air carriers in accordance with European Community law,” the statement said. In the case of the Belfast-Cork route Manx2, as the ‘Ticket Seller’, held a Tour Operator’s Licence issued by the Irish Commission for Aviation Regulation. The air carrier or ‘Operator’ was Flightline BCN which was licensed as an air carrier by the Spanish aviation authority in accordance with the common criteria applying to all air carriers licensed by Member States of the European Union and insured in respect of legal liability to passengers, also as required by European Community Law. Email “Lawyer claims pilots’ decisions were main cause of Cork air crash”. Feedback on “Lawyer claims pilots’ decisions were main cause of Cork air crash”.